The Ministry of Health (MoH) has proposed a mandatory exam for all medical students before they receive medical practice certificates. 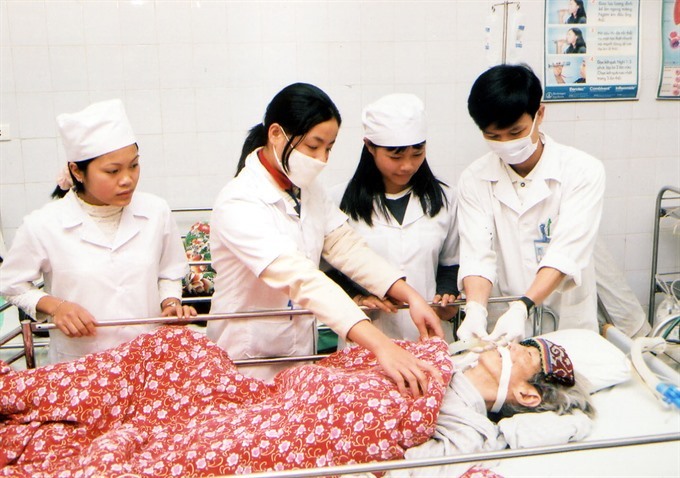 Medical students attend to a patient at Đống Đa Hospital in Hanoi. A new proposal requires all medical students to take a mandatory exam before they can get medical practice certificates. The proposal was made as the ministry noted many shortcomings in the sector’s training and assessment. “Currently, the law only requires that medical practitioners meet several criteria to be granted medical practice certificates, including graduating from medical colleges or universities, having some experience in doing the job. These practitioners do not have to pass any exams to acquire such certificates,” said Nguyễn Minh Lợi, deputy head of the Training and Technology Department under the MoH. “Moreover, such certificates don’t need to be renewed,” Lợi added. Medical practice certificates in some other countries must be renewed at least every five years, he said. Vũ Thị Hạnh from the ministry’s Medical Policies and Strategies Institute said Vietnam doesn’t monitor the quality of medical practice after practitioners are granted certificates. At present, Việt Nam has 24 colleges and universities offering medicine training. Before 2000, the number was only eight. These officials say the boom in medical schools without proper assessment mechanisms has weakened the training quality. A mandatory exam for all health practitioners is supported by most health officials and experts, Lợi said. All health practitioners, including medical school graduates, health caregivers, and technicians, must take this exam so that quality can be monitored, Lợi said. The exam would be organised by an independent institution to ensure objective assessment, said Trần Văn Nghĩa, deputy head of the Examination Department under the Ministry of Education and Training. Nghĩa also said that in other countries, such exams are held by certain associations or institutions, but in Vietnam a Government agency will have to be in charge since no other institution in the country is capable of the task. Lê Quang Cường, MoH Deputy Minister, said the change would require colleges and universities to reform training. “If we let schools assess their students, there’s a high chance all students would pass the exam. That’s why we need an independent institution to hold the exam. To be able to pass such an exam, which will set certain standards for the medical practitioners, schools will have to make changes to meet these standards,” Cường said. Currently, medical schools in Vietnam train students for six years, with students attending residency programmes following graduation. According to the proposal, medical students would train in college for four years. After that, those who want to be a general practitioner must train for two more years, followed by a year’s internship at a hospital. Finally, they must take the mandatory exam to acquire medical practice certificates. For those who want to be specialist doctors, they would need another two to three years practising at a hospital before taking the exam.